Most predictions for Star Mazda this year focused on just how strong this promising field of junior open wheel drivers would be, and thus far, it has not disappointed. Through the first few race weekends, it was English rookie Jack Hawksworth that received the lion's share of the glory, trailed by drivers Connor De Phillippi and Martin Scuncio. There's no doubt Hawksworth had a superb start, but after the Night Before The 500 at Lucas Oil Raceway, at least two American stars showed they wouldn't go quietly in this year's all-important Star Mazda Championship battle. DePhillippi won the first of Star Mazda's two oval events this year, and Sage Karam got back on track after an uneven start by finishing a strong second (a third American, Zach Veach, finished third for good measure). Hawksworth had a 29-point Championship lead going into the Lucas Oil race. Now, De Phillippi only trails by 12 points, with another oval in a couple of weeks at Iowa. For De Phillippi, the significance of his victory couldn't have been more clear. "Getting back in victory circle was awesome," said De Phillippi after his big win. "After the two Barber races, it was definitely a tough pill to swallow but I knew we just had to focus on working harder for the upcoming ovals. This win meant a lot to me because it was such a team effort and we had to work extremely hard to get the car to be as dominant as we were. And that feeling of accomplishment was the best feeling in the world." The San Clemente, California native also reflected on the upcoming fight at Iowa. "Finishing well on the next oval is definitely key. We head into every race weekend looking to win, and we will have the same mindset going into this one. The Juncos Racing guys always have a solid car at Iowa, so I am expecting to have some really good speed for this one." For his part, De Phillippi's fellow American prospect Karam, now tied with Finland's Petri Suvanto for P6 in the championship (31 points behind De Phillippi), also feels as if the battle isn't anywhere near over. "The 2nd place finish at Indy puts us right back on track for winning the title. I think that Iowa will bring our chances even closer to the championship. If you take out the Barber result where I got punted on the last lap, I am right in the top three of the standings. Looking at the law of odds, these guys ahead of us haven't had any bad luck yet. With twelve races to go, I am feeling very confident about climbing the standings," stated Karam when asked about his title chances. Karam also has no illusions as to the talent stacked against him in the field. "We have drivers with F3, GP3 and even three years Star Mazda experience in the field. It's crazy competitive, which will make doing well mean even more." Whether Hawksworth prevails, or drivers such as Connor De Phillippi, Martin Scuncio, Gabby Chaves, Sage Karam, or Petri Suvanto manage to wrest the Star Mazda Championship away from their competitors, they will have earned every bit of that accompanying Mazda Road to Indy scholarship. Meanwhile, drivers such as Stefan Rzadinski and Ashley Freiberg also hone their skills, demonstrating the racing here is not only fierce, but instrumental in forming the drivers of tomorrow. The rungs of the American open wheel ladder are showing plenty of talent, and that can only contribute to a bright future for INDYCAR. Is It Anyone’s IndyCar Championship? (If you're a supporter of Randy Bernard, please take a moment to sign a petition in support of INDYCAR's CEO. Thanks!). In 2010 and 2011, we saw the continued battles between Dario Franchitti and Will Power for the IZOD IndyCar Series Championship. A formula developed; Will generally dominated the road and street courses, while Dario occasionally grabbed a street course victory, but otherwise did enough to hang around in contention. On the ovals, Dario’s performance generally bettered Power’s, and so it could be said Dario’s overall results won him those championships despite Power’s tremendous twisty talents. This year has been markedly different in terms of the Franchitti/Power dynamic. While Will won three straight road/street courses, Franchitti struggled in the early going, never looked completely comfortable in the DW12, and only recorded a truly good result at Sao Paulo. Going into the Indy 500, it seemed as if Power had the makings of a clear path to his first Series Championship. Indianapolis, however, may just have muddied the waters a bit. With Dario grabbing a whopping 54 points in his third 500 victory (and Power garnering only 20 after an early exit), we are now to a portion of the schedule featuring a street course, followed by three straight ovals in June. More than ever, this will be the test of Will Power as a multi-discipline driver. Although it’s usually easy money to take Power for the pole and win at any road/street course, he’s got some drivers relatively close to him in the standings. James Hinchcliffe and Helio Castroneves both sit 36 points back, and the smoothly consistent Scott Dixon (3 podiums in 5 races!) is only 11 points behind them. Power might have a margin of error, but it isn’t a massive one. What, then, of Dario? Currently he sits tied with Simon Pagenaud in P6 overall, 64 points out of the lead. If we know nothing else, we know Dario is very good at making up point deficits, as he’s done the last two seasons. In other words, he might have been down, but he’s not out. Ultimately, this Championship will likely come down to consistency. Will we see James Hinchcliffe blink, or Helio? Will Simon Pagenaud come back with a good result on the ovals? Can Ryan Hunter-Reay return from a disappointing ending to an otherwise good Month of May? Many of us were ready to claim this year’s Championship was Will Power’s to lose after the first four races. He still might have the inside track, but there are a few drivers who just might take objection to crowning him this early. Let’s see how things stand at the end of June—if Power wins one or two of these ovals while his competitors falter, he’ll be looking good. If he has the sort of poor luck or results he had at Indy, then it could be a whole new ballgame. My feeling is, going into the Canada portion of the schedule, we could have an even closer fight at the top than we do now. As Randy Bernard has confirmed on Twitter tonight after Robin Miller's radio interview earlier today, there is at least one team owner attempting to have INDYCAR CEO Randy Bernard removed from his position. I don't know how developed or far it's gone, but I do know I have learned enough history lessons and have seen enough to know that's a spectacularly horrible idea. You don't have to agree with everything Randy Bernard does or says, but if you believe in stability for INDYCAR, and believe it is headed in the right direction under Bernard's leadership, I urge you to sign this petition, expressing your support for Randy Bernard. I am happy to be co-sponsoring it with several other individuals, and hope you will join us. As Abraham Lincoln said, you don't swap horses in midstream. Don't underestimate the power you have as fans to have a great influence on the sport we all love. If nothing else, let's let Randy Bernard know the fans support him. Ryan Briscoe: The pole winner fought for the lead early before falling back a bit. However, he did finish the best of the Team Penske cars, with Will Power involved in a crash and Helio often hovering around the P10 spot for most of the day. It was a good month for Briscoe, but didn't end up a great one. Marco Andretti: Marco dominated much of the first part of the race, but it seemed as if his car faded in the late going. A late crash doomed any hope of a Top 10 finish, and will only serve to perpetuate the Andretti Curse. Early on Sunday, Marco seemed ready to fulfill the expectations so many had for his 500 run, but instead we're left with Marco to think about what could have been. With Ryan Hunter-Reay out of the race with mechanical woes and James Hinchcliffe alone able to secure a Top 10 spot, it's no lie to say this year's Indy 500 fell well short of Andretti Autosport's potential and dreams. Ed Carpenter: Carpenter's great charge from the back of the field was ruined in a moment by his spin, but no one in the stands will deny his status as a fan favorite is perhaps even approaching that of Tony Kanaan. We saw drivers such as Carpenter and Oriol Seriva (P4, somehow!) move doggedly and determinedly from the back of the field on a day that did not lack for surprises. Tony Kanaan: TK's amazing pass on the last restart on the race whipped the crowd into a frenzy, and judging from their mood, I think they would have been just fine with five more laps of caution to close things out. Kanaan remains one of the best in IMS history not to have a victory here, but there's no doubt he'll make things as interesting as possible until he's ready to hang it up. Justin Wilson: Wilson represented many of the drivers we perhaps didn't expect to see fighting up front Sunday. Even his notable P7 finish is not indicative of just how great of a drive Wilson had. Along with drivers such as Charlie Kimball, there was no firm expectation these guys would be fighting at the front of the field, but they outperformed some great drivers and teams today. Takuma Sato: Sato broke hundreds of thousands of hearts with his last-lap crash. He's always had a reputation as fast but reckless, and while there's the fear Sunday's wreck will cement that, his guts and brilliant run through 199.25 laps should bring him some new fans, too. I was initially surprised just how strong the cheers were for him throughout the race, but it does seem he's building somewhat of a following. Taku played his part in one of the most electric races in recent memory, even if the ending was less than what we wanted. I have to admit, I'll be pulling for him to partially make up this one with a Series win, and soon. Dario Franchitti: Really, this spot should belong to both Target Ganassi teammates, who were part of one of the greatest back-and-forth battles the Speedway has ever hosted. Scott Dixon fought him every lap, but it was Dario coming back from an early spin in the pits to win that has to truly rank as one of the classic performances in 500 history. While taking his celebratory lap with his wife, Dario invited Susie Wheldon to ride with him. I know people were disappointed over TK or Sato not playing the role of spoiler, but full respect needs to be given to a man who handled the moment with class, and knows and appreciates the history and legacy of this very special race course. Lying in the fields across from Indianapolis Motor Speedway, the clock has just turned over past midnight. That means it's officially race day. I guess I could tell you it's all quiet and expectantly serene, but we all know better, don't we? A discordant melody of firecrackers, distant sirens, motorcycles blasting past, drunken would-be frat boys desperately seeking attention, and the ever-present hum of music from dozens of campsites is tonight's soundtrack of choice. 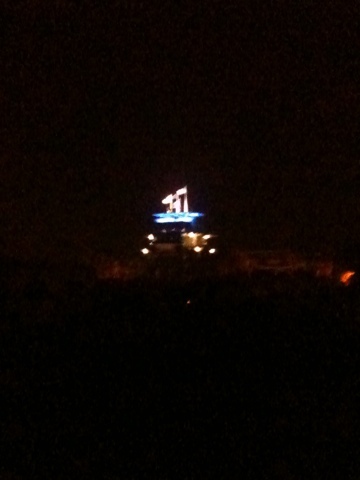 Looking out of the tent, however, the IMS Pagoda shines, towering over the debauchery and inebriation that always precedes it. It's a good reminder that in just a few hours, we will again be racing at Indianapolis. In terms of the race itself, it's somewhat of an odd year, but like every year, I find myself hit with a major dose of insomnia. Every potential scenario I can think of for tomorrow is going through my head, from the military flyover to the winner of the race. Will Scott Dixon be as tough as I think he'll be? Will Marco Andretti be able to save his equipment and make this "the year?" Just how bad is that track going to be with the heat? How will those Lotus entries fare? Whose engine will grenade first? How many cars will finish? How will the Dan Wheldon tributes go? A blast of fireworks nearby jolts me out of my thoughts, but that's ok. It's the night before the 500, and there are hours of unanswered questions ahead of me. If you're having trouble sleeping, whether you're crashing in your truck just outside Georgetown Road or are enjoying the quiet at home, know that you aren't alone. It's race day, and a night's worth of insomnia is worth getting all those questions answered tomorrow. -Esteban Guerrieri was masterful in moving from the back of the field to take the checkered at the Firestone Freedom 100. In a crazy race, he not only stayed out of trouble, but seemed to conserve his ride until he was able to charge later in the race. Let's not sleep on rookie Tristan Vautier, though--he led some laps, fought hard, and gave a good account of himself in his first race at Indy. -The Firestone Freedom 100 is a blast to watch, but is also at least a little bit terrifying. Reckless moves aren't limited to just Indy Lights drivers, but the dive-bombing and blocking was wince-inducing at times. The Lights racing here at Indy is garnering a sure reputation for being the most chaotic, wild 40 laps you'll see all season, and while it's always a hope the drivers behave and stay safe, it's almost hard to breathe while you're watching them dive four-wide into the turn. -Carb Day has a great Lights race, the pit stop competition, and more than a few meetups and team events, but it can also be a trying day for the race fan. Many of the folks here for the concert are of a--well, let's say different nature from your standard race fan. They aren't here for the racing, and they often lack some of the respect of the grounds and other fans that your Pole Day or Bump Day fan might have instead. It's great to see so many folks at IMS, but you can definitely note many of the INDYCAR hardcores headed for the exit before the concert goes full-swing. Now that I sound like a priggish old man, let's move on. -If you had your doubts about this weekend being hot, hot, hot at Indy, don't. The weather yesterday was hot enough, and Sunday should be even more brutal. For fans, that means plenty of water, sunscreen, and being smart with how long they stay in the sun. For the drivers, that means an extremely slick track. I spoke with Ed Carpenter yesterday, and he said that's the assumption for race day. It could be messy, and we're going to have a chance to see who really has setup nailed on their car. Pure, raw speed only counts for so much here at Indy. Enjoy the weekend, and we'll be back with more Indy 500 goodness before long! Happy Carb Day to one and all! As you're reading this, I am likely fumbling with a tent in IMS Lot 2, and realizing I forgot to pack paper towels for this weekend's camping experience. However, before all this, I went through the entire field of 33 for this year's Indianapolis 500 to give my quick thoughts on each. Ryan Briscoe: This year's pole winner has often been considered the third man at Team Penske by fans, but he's clearly capable of some great speed. Indy has not been kind to Briscoe, however; he's finished P23 or worse here in three of his last four 500s. A victory here would obviously send his stock through the roof, and he's not going to find a better chance to make that happen. We'll see how he responds to the challenge. James Hinchcliffe: Hinch has been impressive this year both on the track and off. His humor and personality are a huge hit with fans, and it doesn't hurt that he can really pedal an IndyCar. While concerns remain over his relative inexperience in this kind of race and pressure, this could be the one that really puts him on the map. Ryan Hunter-Reay: Despite starting on the front row, Hunter-Reay seems to be the forgotten man when it comes to the Andretti Autosport drivers with a chance of winning this week. Perhaps that's because his results here have been mixed; after finishing P6 as a rookie in 2008, he hasn't finished better than P18 since. Despite that, RHR can win on ovals, and should have a great car for this year's race. 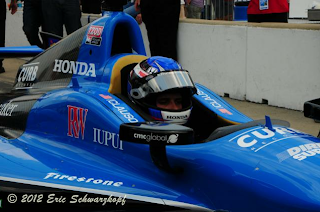 Marco Andretti: Despite his relative youth, Marco will be contesting his seventh 500 on Sunday. He's been routinely excellent at Indy, even when he was in a comparatively poor car. This year, he apparently has a rocket ship underneath him. The Andretti Curse is a powerful foe, but Marco really does seem to be in a good place this month. 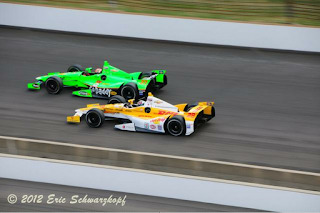 The Andretti cars seemed primed to run out front. (Credit: Eric Schwarzkopf. Courtesy TrackSideOnline.com. Will Power: The biggest knock on Power (a pure road/street ace if ever there was) has always been his relative weakness on the big ovals. That's not entirely fair, given that he's had many good finishes on ovals, but it's also true you won't find many pundits picking him to win this weekend. His overall Series championship lead will likely remain intact after this race, but a great result could push him ahead even more. Helio Castroneves: Helio will again contend for his fourth Indy 500 win, and will again have a very strong car to aid him in that quest. After being a curious non-factor in last year's race, most parties seem to expect him to bounce back in a big way on Sunday. Although he's no longer a clear-cut favorite about all others, he still has to be considered as one of the top three or four picks to win. Josef Newgarden: If you haven't been on the ground at Indy this week, it's possible you've underestimated the fan favorite Josef Newgarden is becoming. In a word: don't. 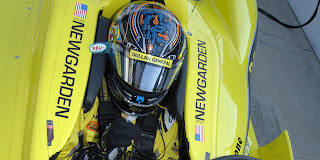 Piloting the only Honda to make the first three rows, Newgarden has simply been fast in his first Month of May. As a rookie, there's the chance he'll make a rookie mistake, but also has the raw potential to give Sarah Fisher Hartman Racing a great finish here. Tony Kanaan: One of the best drivers to not win Indy (yet), a TK 500 victory would be as popular as it would be overdue. No one is quite sure where the KV Racing cars will shake out in race trim (they looked relatively slow before boost was added), but Kanaan will do what he can with what he's given. It remains to be seen if what's given is enough to contend for the win. EJ Viso: Long the focal point for seemingly every on-track mishap for the past few seasons, EJ has always left fans at a loss over his mix of flashes of pure speed and recklessness. Happily, Viso has shown a lot more patience and maturity in 2012. If he can finish all 200 laps and secure a Top 10 finish, it would be a nice note for a season that appears to be offering very real progress. Rubens Barrichello: Easily the most experienced rookie Indy has seen in some time, the former F1 driver struggled to find speed early on in the month, but after boost was added qualified quite well. One of the big questions in this race will be seeing just how Rubens does in this 500-mile test. He's a smart enough driver not to take anything for granted, though, and that's a point in his favor. Alex Tagliani: What's really remarkable about Tag and this Bryan Herta Autosport team is that they were able to make a successful transition to the Honda engine in such a short time span. It feels wrong calling the defending Indy 500-winning team a dark horse, but they have all the tools to make some very real noise on Sunday. Graham Rahal: As the fastest Ganassi in qualifying, Rahal is easily capable of moving up during the race. He's not had the best of times finishing this race, but last year's P3 gave very real hope that's no longer the case. We tend to forget Rahal is only 23 years of age, so likely still has a lot of opportunities ahead of him. Ana Beatriz: I'm not sure how much folks expected from this Conquest/Andretti entry this month, but Bia has looked very, very sharp, both with and without boost. She's finished P21 in both of her previous 500 outings, but it's quite possible this could be a breakout performance by her. If you're looking for another dark horse for the race, don't ignore this one. Charlie Kimball: CK had a very nice month at Indy up until his Bump Day practice crash, and we'll have to see how much speed, if any, was lost as a result. Charlie likely won't be in Victory Circle for this race, but he's shown a lot of growth in his sophomore year in the Series. A nice finish here would be an extension of that. Scott Dixon: Although his qualifying run was disappointing, the Target Chip Ganassi cars should again be close to the front in race trim. Dixon is a professional's professional, and will give the team everything he can to win another Indy 500 here. After last year's fueling issues, Dixie can only hope he gets the same support in return. Dario Franchitti: The defending Series champ has rarely looked comfortable in the DW12 this season, but he's easily one of the best ever to race at Indy, and that means he'll have an excellent idea of just what it takes to win here. He knows consistency and smoothness are big here, and those are both strengths of his on this oval. Don't forget, Dan Wheldon started from this spot last year and won. Dixon, like his teammate Dario, can't be counted out. James Jakes: One year after failing to make the field of 33, Jakes has shown nice improvement at Indianapolis this month. As a rookie and generally unproven on the ovals, a great day would be staying out of trouble and finishing in the top half of the field. JR Hildebrand: Hildebrand might just be the the competitor furthest back in the field with a good chance at winning this year. The Panther Racing crew is always strong at Indy, and after last year's now-infamous last lap crash, there shouldn't be any motivation issues going into the race. The Panther car should be able to move up through the field over the course of the race, and we'll see what happens from there. Takuma Sato: We all know Taku can pedal, and raw speed has never been his issue. However, Sato's consistency troubles still haven't been put completely to bed, and 500 miles is a long way to go. The Rahal Letterman Lanigan crew should give him a good car and strategy; we'll see what he makes of it. Townsend Bell: Bell's reputation as an oval ace is pretty solid, and he's finished well here before. 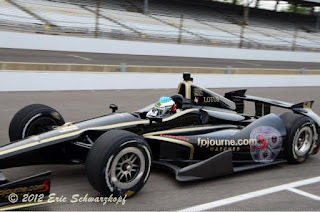 Having said that, the Schmidt Pelfrey car hasn't made any big waves this month, and it remains to be seen if they can show any real improvement during the race itself. Justin Wilson: While Wilson has never been considered an oval specialist, he's an accomplished, veteran driver that can smartly advance his position when the situation presents itself. The Dale Coyne team has looked pretty decent so far this month, so Wilson could be set for a good day if things fall his way. Michel Jourdain, Jr.: After one of the longest layoffs in Indy 500 history (1996-2012), Jourdain returns to the track where he once debuted as a 19 year-old rookie. He surprised many as a first day qualifier, and his Rahal team should give him a good shot at a solid finish. Simon Pagenaud: Pags has been nothing but impressive his rookie season, fulfilling much of the promise Honda and many pundits saw in him. With that said, the Sam Schmidt team looks a bit off the pace compared to last year. Simon is an old hand at longer races, and what his car might lack in speed, he can partially make up with his great track awareness. Sebastian Saavedra: The young Colombian driver did a nice job sliding his car into the field on Pole Day after a blown engine earlier in the session. Saavedra is also running the Firestone Freedom 100 on Carb Day, and his decision to go part-time in the IZOD IndyCar Series while running a full-time Firestone Indy Lights schedule certainly looks like a good choice right now. The AFS/Andretti #17 should have enough push to move up on race day, if Saavedra avoids early trouble in the crowded mid-pack. Sebastien Bourdais: After a tumultuous month, Bourdais finally has a Chevy in his car, and hope in good results once more. The Dragon Racing team seemed to be fighting to find a good balance for his car, but I stopped doubting Bourdais right around the time he finished P9 in a Lotus. It's been a long time (2005) since his last 500, but if anyone can make the most out of this situation, it's him. Bryan Clauson is one of 8 rookies in the field. Wade Cunningham: After winning what seemed like a dozen Freedom 100s, Cunningham finally gets his shot at Indy. Unfortunately, the Foyt cars seem to be struggling to find pure speed this month. Despite being a rookie, Wade is a strategist as much as anything, and could make some moves if he's hanging around at the end. Oriol Servia: With Dreyer and Reinbold now partnered with Panther Racing, Servia has to be enjoying life right about now. He should be in a lower-numbered row, but a Pole Day crash ended that quickly. If his car is close to what it was pre-crash, look for him to be a big mover on the day. Ed Carpenter: An underdog's pick to win the 500 before the month began, Carpenter's team has had to deal with not only a baffling lack of speed, but also a Pole Day crash that ensured Ed start towards the back of the field. Carpenter has a great support team, and is generally very good at Indy, but it will be a wait-and-see game in regards to if he has anything for the leaders on race day. Mike Conway: Like his Foyt teammate Cunningham, Conway has been largely unable to find any sort of speed at Indy this month. After a brutal crash in 2010, he wasn't able to make the field last year. Moving up without incident during the race would be a nice reward, and make the rough times this month a bit more palatable. Katherine Legge: Only acquiring her Chevy engine at the last possible minute, Legge had to contend with a rushed Rookie Orientation and very little practice time. It's probably not realistic to expect too much from this entry on race day, but hopefully the rookie can learn while staying well away from any attrition. Bryan Clauson: The two-time USAC National Champion was looking great all month until the fourth lap of his Pole Day run, where an accident dropped him to this lowly starting position. The Sarah Fisher Hartman Racing cars have been fast, and Clauson has shown a fast learning curve this month. It'll be a long afternoon for the sprint car champ, but the Noblesville native has raw talent. We'll see how he uses it. Simona de Silvestro: A month of dark clouds for the Lotus HVM team got a bit brighter when they received an updated engine before qualifying. Make no mistake, Simona's speeds are still well off the mark, but if she runs fast enough to not be black-flagged and can move up during the race through attrition, that's a victory in and of itself. Jean Alesi: The Lotus Fan Force United team was put together at the last minute, and did not receive their updated Lotus before their qualifying run. Despite having their backs against the wall, they've weathered it with class, respect, and not a small bit of humor. 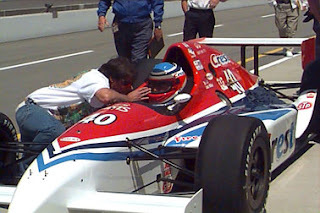 Alesi is a true professional, and will be the oldest rookie to ever make his Indy debut. If there's any way to not get black-flagged, this team will do it. Whether that happens or not, cheers to them for reminding us the best stories at Indy aren't just about the winners. 1) Which driver is your top choice to win this year's Indianapolis 500? 2) Which driver do you consider the biggest "dark horse" to win this year's Indy 500? 3) Which driver will be the first one out of this year's Indy 500? 4) Which driver will be this year's Indy 500 Rookie of the Year? 5) Last question: where will the top Lotus car place? Of course, the real fun will be coming back to these answers next week, when we just how on the mark the top fan choices were in each category. Forget, if you could for a moment, the dirty rumor mill and irresponsible speculation. Forget any gripes you might have, or what the rest of the season might hold. These are the last few days before the Indianapolis 500, and what will happen on Sunday is all the drama we need. Frankly, it’s the Indy 500, and if you aren’t having fun, you’re doing it wrong. Penske Goes For Another (Helio, Too): Roger Penske has already grabbed his 17th pole at Indy this month, and he’ll be looking to add a 16th 500 win as well. With Ryan Briscoe on the Pole, Will Power in Row 2, and Helio Castroneves on the outside next to him, Penske certainly seems like he’s got the pieces in place to give everyone else a run for their money. Castroneves in particular would be a historic victor; he would join Al Unser, Sr., Rick Mears, and AJ Foyt as the only four-time winners of the 500. He would also have the shortest gap between his first and fourth Borg-Warner trophies (2001-2012). The On-Track Chevy/Honda Battle: There’s no denying Honda has been shut out in the victory column so far this year, and fans of their company were probably not thrilled to see the Chevys dominate qualifying last weekend. However, that was with the added boost, and there’s a sense that things should normalize when the cars return to their regular boost levels this weekend. Basically, if a Honda entry can find their way to winning the 500, it would instantly erase a lot of the early-season defeats at the hands of Chevy. Whichever manufacturer wins is going to have some pretty hefty bragging rights in the news cycle to come. Andretti Rising: Last year, Andretti Autosport drivers Danica Patrick and Marco Andretti could barely qualify. Teammates Ryan Hunter-Reay and Mike Conway didn’t. 2012 has proven to be a completely different animal, as all three regular Andretti entries qualified on the front two rows. The additional part-time associate programs with Sebastian Saavedra and Ana Beatriz have also looked strong, and the team seems primed to contend for victory once more at Indy. If Penske can boast Castroneves, Power, and Briscoe, Andretti can counter with James Hinchcliffe, Marco Andretti, and Ryan Hunter-Reay. Any of the three would be a popular victory with INDYCAR fans, and if Marco can pull it off, the casual 500 fans would also have a very recognizable last name back in Victory Circle. The New Guard: While veterans such as Tony Kanaan and Dario Franchitti aren’t ready to hang it up yet, this season has shown the future of IndyCar is tremendously bright. It’s been very easy to be impressed by recent additions such as Josef Newgarden and James Hinchcliffe, both of which have become almost instant fan favorites. Simon Pagenaud has been sharp, and Bryan Clauson represents a potentially re-opened gateway for USAC drivers. Charlie Kimball has shown nice improvement in his second year, and is joined by young legacy drivers such as Marco Andretti and Graham Rahal in forming an extremely rosy outlook for the relative talent level of the Series in the coming years. Right now, we get to see the veterans of the Series at their prime mix it up with the young guns of tomorrow, and that makes Sunday’s battles a tremendously exciting prospect. Newgarden's star potential can't be ignored. The Plight of the Lotus: Although they’ve handled it with grace and professionalism, there’s no denying the Lotus engines for HVM Racing and Lotus Fan Force United are off the pace. It’s been great to see the outreach and attitude of both teams (especially FFU’s PR efforts), but they’ll need to show more speed during the race to not get black-flagged. Their updated engine seems to add horsepower and hope (the two are closely linked, you’ll find), but just how much of a bump they get from it in race trim remains to be seen. It’s hard to not pull for these teams, both of who have made the best of a frustrating situation this month. If they can hang around during the race and finish while running, that would be a nice story in its own right. (As a side note, I spoke with Paul Dalbey this weekend about the idea of the Fillip Line. Much like the Mendoza Line in baseball is used to illustrate a considerable lack of hitting prowess, falling below the Chet Fillip line of running 11 laps in the ‘83 Indy 500 before being black-flagged would be a notorious accomplishment in its own way. I’m not sure if it will catch on, but I like it). The Dark Horses: Honestly, when is the last time we’ve seen a field with this much lurking talent? As much as anything, you get the feeling that we really haven’t seen the best from some of these teams and drivers yet. Even in the back of the field, there are many drivers that might provide this year’s surprise frontrunner. We know Ed Carpenter can be fast here. Wade Cunningham knows his strategy, and if he stays out of trouble could make things interesting late in the race. Simon Pagenaud hasn’t failed to impress yet, and fellow Honda driver Takuma Sato is adept at giving us those flashes of brilliance. And, of course, we know Sebastien Bourdais knows a thing or two about winning. One of the most exciting parts of this race for me is there are so many drivers you just can’t quite count out of a very good Top 10 or even Top 5 finish. Before you scoff at any of these names, consider this: how many of you had Bertrand Baguette coming within a couple laps of winning last year’s Indy 500? This is one of the deepest fields we’ve enjoyed in a long time, and that means counting very few drivers out before the flag drops. I might not know who’s going to win on Sunday, but you have to think it’ll be a fight all the way. Make Your Indy 500 Picks! With qualifying in the books and 33 cars set to take the green flag this weekend, we're just about ready for the 96th running of the Indianapolis 500. You're going to see a lot of predictions this week, grades and lists of drivers, and both off the cuff and well-reasoned opinions on how this year's 500 will go. What I'd like to do today, however, is hear from fans and readers on who their choices are for this year's Indy 500. I've created another one of our surveys, and I'll release the results this upcoming Wednesday. Please take a moment to give us your vote for this year's winner, your dark horse pick, first car out, and your 500 Rookie of the Year pick. Just follow the link below to give your opinion! Here are 24 idle thoughts and notes I took before and after today's Pole Day action. 1) We have to start with congratulations to Ryan Briscoe for winning the Pole today. With that said, you definitely get the feeling that there are drivers throughout this field who feel race day could be a very different animal indeed. 2) The Andretti Autosport not only qualified their main drivers in the front two rows, both of their associate cars (Ana Beatriz, P13), and Sebastian Saavedra (P24), managed to qualify today. I really thought they might send Bia back out, but it was still a very solid run--pretty clearly her best ever at Indy. 3) The Pole Day crowd was nice--perhaps not quite as big as I thought it would be given the size of the crowd on Fast Friday, but a pretty good showing regardless. I am worried about tomorrow's attendance--with multiple sources stating no bumping is involved, and a big Indiana Pacer game in the afternoon, that could really hurt the Sunday crowds. 4) Speaking of the projection of only 33 cars for this field, I'm not sure what to think. On one hand, we have Randy Bernard very clearly stating on Twitter that entries for Bump Day have not been made verboten. On the other hand, I know of at least two Bump Day deals that sounded pretty solid, and both mysteriously and suddenly evaporated this morning. I'm really bummed for Pippa Mann, as I think it would have livened Bump Day up tremendously to see her out there. 5) Staying with Pippa for a moment, she appeared at a tweetup with fans at the Social Media Garage barely an hour after receiving the crushing news her deal for Indy had been killed. If it were me, I would have stayed somewhere and pouted, but Pippa did an entire Q&A session with fans. If you have ever questioned why her popularity with fans endures, that's a good indicator right there. That's pure class and graciousness in a moment when she was probably feeling anything but making that effort. 6) I'm torn on the idea of no bumping. On one hand, if the number of entries is being artificially limited, then that goes against the idea of Indy in a pretty big way. On the other hand, with the job Lotus Fan Force United has done, I'd hate to see them bumped. Competition would win that choice for me, but after talking with fans around Gasoline Alley today, there seems to be no doubt that their valiant effort this month has garnered fans and goodwill in equal measure. 7) I thought James Jakes' second run to solidly land himself in the field today was an excellent run under pressure. I'll admit, I thought he might be a second-day qualifier, but the Dale Coyne Racing cars did what they had to today. 8) It was also great to see Sarah Fisher's team land a car in the Top 9 for the second straight year, and I'm not sure Josef Newgarden could be much more popular with this Indy crowd. 9) We also have to discuss Sarah Fisher's other car, which unfortunately had a much rougher day. Bryan Clauson was at the tail end of a great qualifying run when the car came around on him. Fortunately, it doesn't sound as if he was badly hurt, and can qualify tomorrow. Clauson has done a great job so far this month, and hopefully he's able to compete for that P25 tomorrow. 10) Clauson, of course, wasn't alone on crashes,with both Oriol Servia and Ed Carpenter being involved in some heavy qualifying crashes. It's a good reminder that Indy can bite seasoned veterans just the same as rookies. 12) I didn't expect either Dragon Racing car to be a first-day qualifier, but I did expect at least one of AJ Foyt's cars to make it happen. Wade Cunningham didn't look particularly comfortable on his qualifying runs, and Mike Conway just didn't quite have enough to get it done. 13) If we're continuing with Honda woes, how much is the fact that only a single Honda car made the Fast 9 going to be dissected and scrutinized over the course of the week? 14) Back to the Lotus cars for a moment: I think both cars have a bit left in them for qualifying. They should be able to qualify in relatively cool air, and hopefully their speeds creeps up a bit. It would be great if both teams were able to get that much closer to the median speed of the field. 15) Seeing Parnelli Jones drive Ol' Calhoun around the track was amazing--the sound of that engine even more so. 16) I have had a lot of fun meeting readers over at the Social Media Garage, and we've also been lucky in having special guests such as Wade Cunningham, Pippa Mann, Shannon McIntosh, and Ashley Freiberg swing by. I'm hoping we have a lot more in store between now and the race. Seeing Parnelli driving Calhoun: Magic. 17) Drivers I thought would go back out for one more attempt at the Fast 9, but didn't: JR Hildebrand, Scott Dixon, and Ana Beatriz. 18) If JR Hildebrand is going to avenge his narrow miss at 500 glory last year, he'll have to make history: no one has ever started from P18 and won the Indy 500 (though there's always got to be a first). 19) There remains no better breakfast known to man than a pork tenderloin and coffee early at the Speedway while the Gordon Pipers play in the background. 20) Rubens Barrichello looked really sharp today, despite his practices up to this point not really showing consistent speed. Starting P10 in his first Indy 500 is pretty great to see. 21) James Hinchcliffe wearing Greg Moore's gloves over his heart was a special moment, one that will be remembered a very long time, I think. 22) Today's stats: 24 cars qualified, 2 pork tenderloins eaten, approximately 17 gallons of water consumed (plus 1 thermos of coffee), and 3 layers of mostly useless sunscreen on my pasty, pasty blogger's complexion. 23) It's no contest: Sebastien Bourdais' #7 machine and the #64 of Jean Alesi are easily the two most stunning liveries when they're on track. Pole Day: Good Morning From IMS! Happy Pole Day to one and all! If you didn't check out our 1-page guide to today's action, make sure to give it a glance. The Lotus Fan Force crew was hard at it as we went past. Charlie Kimball's #83 was being fired up just outside their garage. AJ Foyt wasn't out and about yet, but Wade Cunningham's car was wheeled past. I'm digging the chrome and the big ".com" on Hinch's nose cone and front wing. Townsend Bell's crew wheeled past as well. Of course, it wouldn't be Pole Day morning without the Gordon Pipers. Here they are, playing "Scotland the Brave" on the bricks. That's all for now, but stay tuned for a great Pole Day, whether you'll be at the track or watching from home. The question marks surrounding today means we'll all be surprised more than once before it's all over. Also, make sure you check out our interview we did with Wade Cunningham from in front of the Social Media Garage (yes, I know I shouldn't have been chewing gum--terrible habit)! Here's to a successful Fast Friday in the books, and a great Pole Day ahead! Just a quick update from the Greatest Race Course In The World. Fast Friday is in full swing today, and the crowd is simply enormous for a Fast Friday. Honestly, we have had qualification days in the past without this big of a crowd. We've seen Michel Jourdain's car go en fuego, Chevy at the top so far with the boosts (as I write this, Ryan Hunter-Reay is at the top at 226.227mph), and rumors continue to grow of anywhere between 1 and 3 "extra" cars showing up on Bump Day. It sounds as if the contingency plans are in place, but we'll have to see how things pan out Pole Day. A bad run then could nerf any extra car plans in a hurry. Really, there's excitement for these new cars right now. Fans are cheering every speed jump, and there's just this uncertain intensity to the whole proceedings. We're all trying to figure it out, be it drivers, teams, pundits, and bloggerati. And that just makes it all very, very cool. The weather is perfect, the speeds are going up, and the crowds keep coming in. What a perfect day to be at Indy (and the Social Media Garage!). It was late 2005, and I was stationed on a remote Air Force base in a rugged, quiet part of Spain, away from the tourist buses, any major metropolitan area, and worst of all, my young family, who had returned to the States to take care of a family emergency. They would not return for the entirety of my tour. Despite the amazing country I was in, I was miserable, drank too much, and wished more than anything I could be home once more. I had been away from Indiana ever since I enlisted in 1999, and had seen the world, both good and bad. I was stationed and deployed both stateside and overseas, from Korea to Texas, dealing with some truly nice places—and a few truly unpleasant ones, as well. Yet, in my mind, Indiana was forever home. When I was young, having the Indy 500 on in the background during family Memorial Weekend celebrations was taken as an assumption. I’ve mentioned before how I used to bet my grandpa $1 that Rick Mears would win against the field. Growing up in Indiana or even elsewhere, if you’re reading this right now, there’s a good chance you have similar childhood memories. At that moment, however, back in 2005, it was Memorial Day weekend, and once again the Armed Forces Television channels were not cooperating. I was trying everything I could to watch the 500, but all I could do was catch glimpses in between the hissing static and snow that obscured nearly the entire picture. I’ve never told anyone this before, but it just seemed a perfect representation of how I felt at the moment. I was low. I was cut off from everything, unable to connect to something that was a part of my heritage and family. I’ve certainly been in worse situations, but it was one of those moments of pure frustration. I’m pretty sure I threw an epic tantrum in an empty house, complaining to the universe and God about—well, everything. Miraculously, at the end of that petulant rant, the picture came back in. I was able to watch the end of the Indy 500. It brought back so many connections to home, so many memories. It’s funny that things in the background can jump to the fore so quickly. Just watching that grainy feed made me feel connected again to the world I had known, and by association, my home and family. I have written countless times on this site about just what is special about the Indianapolis Motor Speedway and the Indy 500. We often talk a lot about the parts of Indy we love, from the personalities to the traditions to the history and more. Yet none of that really addresses why Indy moves us, and becomes such a passion for people. Sometimes, things just hit us on some deep, nearly subconscious level. Perhaps it’s a fond childhood memory, perhaps it’s the way we feel when we’re at a place. Perhaps it’s nothing we can ever explain. But the fact remains, hundreds of thousands of people find the Indy 500 during May a place that feels very much like home. There are very few places in the world I can feel entirely at peace, but Indianapolis is on that list. So, with the excitement and affinity for the place and the spectacle, perhaps not precisely knowing why we love Indy, we return every year. The Gordon Pipers, the pork tenderloins, the grumpy yellow shirts, the drive in underneath the track, the sight of a former driver barreling past on a golf cart, the bronze badges, the electric thrill that shoots through you when someone starts a qualifying run, and the incomparable events of race morning—they’re aspects of something we’re drawn to. It calls to us. Sitting at work leading up to the race, how readers catch themselves looking out the window wistfully, their mind miles away, reading every update they can from practice, and generally being at about 5 percent of normal productivity? All month of May, we sit in our offices, hearing a siren call to a place we can’t wait to see once more. And if we get defensive over our traditions, spirited in our discussions over drivers and teams, wildly opinionated in our defense of matters ranging from the pace car driver to advertising strategies, or seemingly illogical about this track and this race in any dozens of other ways, it’s because love is illogical. Love simply is, and has no need of reason. This year, 6 years and 50+ pounds removed from my Air Force career, I’ll be taking my oldest daughter to Fast Friday, just as I took her younger brother and sister to days of practice earlier this month. Ultimately, I don’t know if Indy will mean the same thing to them that it means to me. I do know that hearing the excitement in their voice when they see a favorite driver, watching their amazement at the cars zipping past, explaining the history and magic of the place, and just happily experiencing what Indy can be with them is something I wouldn’t trade for the world. Maybe I can’t explain it, but I feel it in my soul. It would be easy for the eternal pessimist to look at the low car count at Indy this season and immediately conclude this year’s run-up to the 500 is doomed to be a tepid, drama-free affair. Yet thanks to some new competition, a new car, and new engines, nothing could be further from the truth. Anyone who’s watched Indy 500 practice so far will tell you there’s something riveting in watching these car/engine packages try to find their potential. Although speeds are down a bit from last season, to most fans, it hardly seems to matter. We have progressed from laps of 218 at IMS to Marco Andretti’s 223 mph. Watching teams develop, test, and work these new machines is something that was missing, and we’ve got it again. The engines battles, trying to guess if teams are sandbagging or running with a tow—it’s all this tremendous mystery, one that’s revealed bit by bit as the month goes on. This year’s Pole Day is going to be something to see, with so many drivers and teams seeming to have found something at various points. Yet we won’t really know until they do those first four laps that really count, will we? There's a vibrancy to the proceedings this year. Of course, there's always passion and excitement at Indy, but the wild Happy Hours at the end of each practice, the continual one-upmanship on speeds, and the mix of new drivers showing the old guard that they mean business has made this into one of the most intriguing Month of Mays I can remember. We get to watch as each team tries to put all the pieces together. Perhaps most intriguingly, there's no guarantee that the traditional powerhouses will be the first or only ones to solve that puzzle. While I still think we have some possible driver surprises in store, even if we don't, this has been a great month so far to be an IndyCar and Indy 500 fan. By all accounts, that will continue through the weekend at IMS. The weather is perfect, the action is tremendous, and the unknowns legion. I can't think of anywhere else I'd rather be. Headed to the track? Check out the Indianapolis Motor Speedway's Social Media Garage, featuring contests, social media displays, driver appearances, tweetups, bloggers on location, and more! Stop by MotoGP Garages 34-35 by the Pagoda starting on Fast Friday for more! We look at the Indianapolis Motor Speedway as a cathedral of speed, and rightly so. Even in years where the speeds have been down a bit, there remains the goal of traversing one of the most challenging ovals in the world as quickly as possible with the car and engine at your disposal. However, that doesn’t mean only the record-breakers should have their moment in the sun. Since last week, I have watched the last-minute program of Lotus Fan Force United and Jean Alesi attempt to find their place in this year’s Indy 500. With the Lotus package a challenge to say the least, the team has sought that extra kick to find 210 mph they needed to complete Phase 3 of Rookie Orientation to be cleared for qualifications this weekend. It has not been an easy road. Let’s be honest; as the team has struggled, comments online have not always been kind. While the Lotus FFU team is doing an excellent job at social media outreach, we’ve heard it all. Lotus can’t hit the required speed. Alesi is too old and out of practice for this type of quixotic quest. This program has no business running Indy. Social media isn’t always a sympathetic place, especially when there’s any sort of weakness perceived. Yesterday, towards the end of the day, after a frustrating weekend and having found no speed earlier in the day, the Lotus FFU team once more sent Alesi and their #64 machine out for another attempt. Towing behind Penske cars, the laps of 210 and 211 began to be recorded. By the end of their practice stint, they were running 210, solidly, consistently, without a tow. I commented yesterday I can’t remember ever being that invested in a team going 210 mph. Although it isn’t the finish line, it still felt like a well-earned accomplishment for that team. Underpowered engine, small team, a driver many have scoffed at (evidently without justification) as being unready or too old—yet they did it. Of course, that’s not the ultimate goal of this Indy Lights-turned-IndyCar team, one that incorporates an incredibly expensive watch company and Jonathan Byrd’s Cafeteria as sponsors at the same time it brings together Tyce Carlson and Jean Alesi. Part of the fun of Indy has often been some of the odd bedfellows one-off 500 entries create, and along with Alesi and Carlson, you've got Greg Beck, Tim Wardrop, Buddy Lazier, and many others coming together to try to make this happen. They’ll work to get more comfortable with their speed and performance, hope to give a good account of themselves in qualifying, and prepare for a race few could have projected they’d be a part of just a couple of weeks ago. Make no mistake, as dedicated and focused as this team might be, they have a herculean task in front of them. But they’ll be taking the journey with more than a few new fans, I’m betting. While Josef Newgarden and Marco Andretti rocked the top of the speed charts during Happy Hour, near the bottom of the times on the day was a very good intimation that Indianapolis isn’t just about speed. It’s about perseverance and faith, as well. Many times the latter two end up equating into the former, surprisingly enough. The Speedway gives competitors precious few things freely, as the Lotus FFU crew and Alesi would likely tell you. It does, however, offer the rest of us a free reminder that the best stories are not always found at the front of the field, and that there's not just one victory to be found in the Month of May. Every day at IMS is filled with a thousand victories and defeats in miniature, and in them, we can find all manner of champions. 1) There are very few things as pure and as fun as watching your 3 year-old son go wild with excitement every time an IndyCar zooms past. 2) It's far too early to tell, but if Sebastian Saavedra can stay on top of the Firestone Indy Lights standings and manage a good result at Indy this season, his decision to focus on Lights while just running the 500 this year will seem like a very sharp one indeed. 3) Jay Howard and Pippa Mann are still hanging around, and don't seem ready to give up on a ride at Indy this year. I hope their perseverance pays off; there very well could be more to be written this month, in any case. 4) On a possibly related note, the entire situation with Dragon Racing and their lawsuit with Lotus remains pretty nasty, apparently. Every person I spoke to in regards this week used one of two expletives to describe the situation--and one used both. 5) If the Dragon Racing deal isn't put to bed by the middle of the week, I just don't see how the team has much turnaround time to get anything done. Legge needs her Rookie Orientation, and installing a Chevy in a car isn't quick job. There's a Dragon presence at Indy, but it's pretty sparse just now. 6) I have no idea how the Lotus Fan Force United effort will end this month, but that car looks way too good to not be going fast..
7) Not to be Mr. Obvious, but the Lotus HVM team is struggling so far, and in a big way--even more than their Lotus FFU counterparts, it would seem. That's a tough position to see Simona de Silvestro in. Whatever else, the Lotus FFU car doesn't lack in style. 8) So what's the pole speed going to be? I'm still thinking in the 223 range, but it's hard to tell precisely how much that Pole Day boost is going to provide. 9) On the subject of speeds this year, I will point out this is hardly the first year the 500 has seen a drop in speeds during the Month of May, and it's far from the most drastic. We're talking about a few tenths of a second, honestly. Yet some people act as if we've switched to running soapbox derby models out there. 10) The turbo engines really sound great, though I think some folks are surprised by how relatively quiet they are compared to last year's normally aspirated V-8s. 11) I still have not had my first pork tenderloin of the month. That honor is reserved for the morning of Pole Day, where my thermos of coffee, the track coming to life, and a newly-purchased pork tenderloin give me my most relaxing, zen moment of the year. 12) Let's talk Sarah Fisher Hartman Racing for a moment. Let's all agree that Penske and Ganassi haven't released the hounds yet, but SFHR has to be really proud of both their rookie drivers so far. There's a lot of May left before we crown Bryan Clauson or Josef Newgarden the Next Big Thing, but neither has looked like a rookie so far. In particular, there's something about the way Newgarden drives--as if he's showing everyone precisely why he's here. 13) Back to Clauson for a moment; there's been a lot of skepticism about his readiness for this track, and I suppose we won't know for sure until the checkered flag waves in a few weeks. But everyone I've spoken to thus far has been really impressed with his focus and performance so far. 14) Staying with the rookie commentary for a moment, let's appreciate the depth of the rookie ranks this year. We have two accomplished F1 drivers in Rubens Barrichello and Alesi, a burgeoning All-American in Newgarden, a two-time USAC National Champ in Clauson, the longtime Freedom 100 ace in Wade Cunningham, and an apparently improved James Jakes in the mix. 15) Attendance at IMS looked pretty good Saturday, but on Sunday, it was sparse. With any luck, crowds will be better for this year's Pole Day--I think we're in for as good a battle as we've had in recent years. 16) Over the weekend, I asked my three children who they thought will win the Indy 500 this year. In a stunning upset, we had one (strident) vote for Scott Dixon, and two for Bryan Clauson. Did I mention we live in Noblesville, Indiana? 17) Speaking of Noblesville, nice work, Conor Daly. Congrats on the GP3 win, but I hope you'll understand when I say it'd be great to see you back at Indy one of these days. 18) I don't know about you, but walking in and hearing the Gordon Pipers playing just really sets the mood for a great IMS morning. 19) I remain convinced the best way in which any fan can help grow the sport is to simply treat people to a day at Indianapolis Motor Speedway. The atmosphere, the history, and the accessibility, combined with up-close action, is simply the best. 21) I'd have a hard time deciding on the best livery so far, but Ed Carpenter's Fuzzy's Vodka car and Lotus FFU's designs both really stand out nicely in person. I'm also a sucker for the Dollar General livery Josef Newgarden is sporting, but I'd like it a lot more if it were less temporary (hint, hint, DG). 22) It is really, really odd to see Dario Franchitti driving the #50 car. 23) It was busy week for interviews last week, but hopefully you didn't miss our questions with Lotus Fan Force United's Tyce Carlson, SFHR's Bryan Clauson, or 500 veteran Dr. Jack Miller. 24) We're getting to the end, but let me just put a bug in your ear about the IMS Social Media Garage. Some of my fellow bloggers will be joining me as part of the social media experience at Indy this year, with a dedicated space featuring exclusive driver interviews, meetups, giveaways, and lots more. The social media garage will be in MotoGP garages 34 and 35, and will be open as long as the gates are starting on Fast Friday. I hope I'll see some of you out there. "I think of Indianapolis every day of the year, every hour of the day, and when I sleep, too. Everything I ever wanted in my life, I found inside the walls of the Indianapolis Motor Speedway. I love it all, from the first to the last day in May". I'd say that sums it up nicely. With the first two phases of Rookie Orientation out of the way, the small Lotus Fan Force United team, driving with Jean Alesi, has already achieved far more than their detractors have ever thought possible. From a car that wasn't even assembled a few days ago to turning laps at the Speedway, the Firestone Indy Lights team has worked to get the job done, quickly, and in a big way. How long had your team been looking at running the 500 this year, and when did this deal finally come together? TC: As of last week, we had no plans at all to run the 500. Our focus was solely on our Indy Lights program, with our full-season program with Armaan Ebrahim. We had added Emerson Newton-John for the Freedom 100, so we knew we had twice the amount of work ahead of us. Of course, we had aspirations to run IndyCar and the Indy 500, but we knew that was going to be 2013 at the earliest. When this opportunity presented itself to us last week, we ran with it. Your team does have some Indy experience in the ranks, including Tyce's two Indy 500 starts. Is that having a steadying influence in terms of what to expect this month? TC: Probably. More importantly than that, we were fortunate to be able to call on some really good people, and they have been put in place for a reason. I'm going to rely on them. We already had a pretty solid team established for our Lights program, and they are truly the foundation of our Indy 500 effort. What does having experienced hand such as Greg Beck and Tim Wardrop on board mean for your effort? TC: It means the world to us. We would have never considered doing this if we didn't already have that foundation in place, with Greg and Tim on board for the full season with Armaan. I have some history with Greg, as he was my engineer and team manager when I raced for Hubbard-Immke Racing. Our team manager, Ted Bitting, has probably been the most crucial member of the operation over the last week, as there was no way we could have pulled this off so quickly, in every way from crew to parts, without Ted's hard work. Of course, it's more than Greg and Tim working on the car. We have Owen Snyder, Brad Brewer, Mike Colliver, Ian Brown, and others. It's just a ton of Indy experience in our garage right now. I sit back and watch them work and I think it's pretty cool. With a late, surprise announcement and an Indy rookie driving for you, do you see yourselves as the true underdogs of May? TC: I don't look at us as the underdogs, though it's always nice to have people pulling for us, whatever the reason. Every team out here has the same challenges. The goals are to get competitive, comfortable, and to be able to give our driver a solid racecar that he can run all day without any problems. So underdogs or not, the focus is the same, and we want to do everything we possibly can to get all of our drivers as close to the top step of the podium as possible. What sort of expectations does the team have for their first foray at Indy? TC: We just plan on setting goals and meeting them. We've been doing that for the last few days, and that's what we'll keep on doing. So we plan to complete ROP, move on to getting plenty of track time, prepare for qualifying, qualify, prepare a good race car, run fast in the race, and finish the 500 miles. So our expectation is that we will meet each one of these goals. What's it like working with Jean Alesi in this effort? TC: With the way that everything has come together, I have not yet had much one-on-one time with Jean. The interaction level is a bit different than it would have been had a program come together in the more traditional way. He's busy with the car and the engine and the engineering staff, and you can imagine how busy all of us have been in general, so we have not had a lot of time to talk. Of course, you know I'm a fan, so we've had some very pleasant conversations. I'm just excited to know that he's happy with what he's seen from us and very confident about what he's doing and his prospects for success. Special thanks to the folks at Lotus Fan Force United for finding time to get this interview in! Whatever else might be going on, there are cars--new cars!--roaring to life at Indy. I'm ready to head to the track tomorrow, to get chills when I drive through the tunnel under the track, to hear the turbos come to life as the first official practice of the 96th Indianapolis 500 starts. I don't know how it will all end up, but I know I will be right there, watching everything from start to finish. -We have to start with congratulations to this year’s Rookie Orientation graduates: Josef Newgarden, James Jakes, Rubens Barrichello, Bryan Clauson, and Simon Pagenaud. Additionally, Michel Jourdain got through his refresher regimen. All six of these drivers will be eligible for full practice, starting on Saturday. -However, perhaps the biggest story right now is the snafu surround Dragon Racing’s attempt to sign with Chevy. With the uncertainty of their legal situation with Lotus, it sounds like they could be seriously up against the clock when it comes to signing a deal. Remember, Katherine Legge needs to complete the entirety of rookie orientation, and Sèbastien Bourdais needs to do his refresher program laps. The longer this draws out, the less pretty of a scenario it is for at least Legge. Will there still be 33 cars if Dragon is unable to procure a Chevy deal? You have to think yes. We know the engines are out there, and it sounds like both engine manufacturers are willing to throw at least an additional engine out there if the circumstances are right. So for those of you holding out hope for your favorite unsigned driver, hang in there—as I’ve said before, nothing is final until the gun sounds on Bump Day. -Lotus Fan Force United wheeled Jean Alesi’s #64 machine out, but the team only got through some installation/shakedown laps. That’s probably not surprising, given the amount of catching up this team needs to do, but it was just good to see them on the track. They’ve got a massive amount of work to do, make no mistake, but again, they have excellent people on their side to make it happen. They'll do what they can. and hopefully can get through the first two phases of ROP later today. -On that note, don't forget, a special ROP session for Alesi and Wade Cunningham (the two Dragon drivers are unlikely to show) is scheduled for 4:30-6:00 pm this afternoon, following the Firestone Indy Lights practice session. 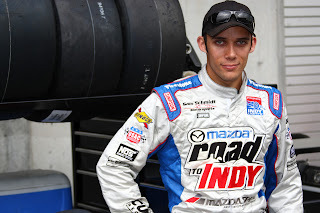 -Speaking of Lights, one of this site’s very favorite Mazda Road to Indy prospects will be back at Indy for the Firestone Freedom 100, and that can only be a good thing. Anders “The Viking” Krohn will be giving the Bryan Herta Autosport machine a shakedown tomorrow. There's no deal yet, per Anders, but hopefully it's just a matter of time. -Although it was released right in the middle of Rookie Orientation, it was wonderful to see news of a proposed 5-year agreement between Andretti Sports Marketing and the City of Baltimore. Baltimore’s future with INDYCAR has looked rocky, despite last year’s event being a nice success from a crowd and racing standpoint. Hopefully, if this partnership goes through, the Baltimore race will get the time it needs to mature as an event and become a signature on the schedule. Have a great weekend (how could you not?). I’ll be out at IMS for Opening Day and likely Sunday, as well. We’ll know a lot more when we reconvene on Monday! (Don't forget to download our updated Indy 500 entry list pdf! It should represent the most up-to-date entrant information, based on what we know now). All Indy 500 fans have memories that stand out to them, but one of mine still has to be seeing the Crest Racing car driving at Indianapolis. In 1997 and 1998, this car really stood out as a unique livery among all others. The man who drove that car, Dr. Jack Miller, has one of the most interesting back stories in the history of the Indianapolis 500. A practicing dentist as well as racer, he made 22 total Indy Racing League starts between 1997 and 2001. He appeared in the 500 three times, and basically got to do the one thing so many of us dream of doing, young or old--putting together four laps and qualifying for Indianapolis. Dr. Jack was kind enough to agree to an interview about his life in racing and at Indianapolis. I hope you find it a great look at an Indy name many people have heard of, but few of us really know. Thanks so much for your time, Dr. Jack. When did you first get involved in American open wheel racing? JM: 1987 in the SCCA Formula Ford series. When did reaching the Indianapolis 500 begin to be a goal of yours? JM: Ever since I was a child, my parents would take my brothers, my sister, and I to the track. I remember one of the highlights was getting free decals like STP , etc. I would place them on my riding lawn mower and in my room. I was totally hooked on the Indy 500 as a child. The sound and speed of the cars was the draw for me for wanting to drive. Did you continue your dental career full-time during your IRL racing days? JM: No, I was raising sponsorship dollars, driving the car, meeting sponsorship requirements, show car programs , etc., I was very busy. My wife is a dentist; she ran the dental offices while I was on the road. I did see patients approximately a half day a week. I mainly do extractions, but I did stay current, with continuing education courses. Let's talk about that Crest sponsorship, which led to one of the more distinct liveries we've seen at Indy. How did the sponsorship come about? JM: It was difficult to land Crest as a sponsor. Proctor and Gamble was decreasing their motorsport involvement at the time I approached them. I put together a mobile dental clinic program, which included dentists volunteering their time to give screenings throughout the USA. Crest brand loved the idea and sponsored the race program. They were fantastic to work with. The paint scheme and colors made the car an instant hit among fans. Not only did they sponsor the race program, they also paid me to drive. I will always be thankful to P&G for their involvement in my program. Can you recall the feelings or emotions that came with your driving experience at Indy? JM: Driving at Indy is the best, period!!! I love the track, the speeds are awesome. Not to sound corny but there is no better place to race a car then at 16th and Georgetown. When did it first sink in that you were going to get to drive in the Indy 500? JM: After qualifying. I went out third and solidly qualified 17th. I knew I was in the field and would not get bumped. After the interviews I said to my family I'm starting the Indy 500 I felt like I was on top of the world. That was the greatest day of my life. JM: I had many friends that I made in the Indy Lights series. I really respect Arie Luyendyk; he was always fast and willing to give advice. It was an honor to race against him. I also respect Scott Goodyear; he did such a great job at Indianapolis. You made your last qualification attempt at Indy in 2000. Did you ever consider another shot at Indy after that? JM: Yes, in 2001 I was driving for Olympus Cameras. I was involved in the huge crash at Atlanta one week before opening day at Indy. A rookie started the crash that took out 13 drivers. I got the free helicopter ride to the Atlanta medical center. I had some injuries that ended my driving career. What do you consider your biggest accomplishment from your IRL/Indy 500 days? JM: Having secured great sponsors. Being the only Nissan to make the field in 1998, qualifying 15th. Most important is that I achieved my lifelong goal of driving Indy cars and racing in the Indy 500 multiple times. Of course, the novelty of the dentist in the 500 gave rise to nicknames such as "the driving dentist". Do you remember hearing any of that at the time, and what did you think of it? Was it something you embraced, or just generally ignored? JM: I was taught by great parents to follow my dreams and never give up no matter what. They taught me there will always be someone out there trying to discourage you. The advice they gave me was ignore them stay focused and keep moving forward. No the racing dentist didn't bother me at all. People knew who I was and that was great for the sponsors. I am proud that I received my dental degree eight years of college and dental school was well worth it. Do you have any general involvement in racing or the Indy 500 these days? JM: No direct involvement but I do have many friends that are current drivers like Alex Tagliani and Jay Howard that help coach my son in go-kart racing. My son will race Indy cars and with the help of many people along the way will win the Indy 500. I started racing at age 26; he started racing at the age of 3. Looking back at your IndyCar and Indy 500 career, how would you summarize it? 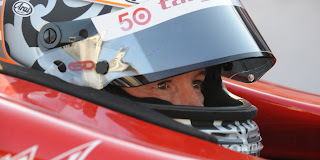 JM: I loved my Indy car career. I didn't win but I had the time of my life. The speeds are so much fun. You are in total control of the car, what an awesome feeling. I did the best I could do with what I had to work with, I am having as much fun traveling across the United States with my son racing go-karts as I did racing myself. God has given me a great life. One more piece of the pre-race Indy 500 festivities has been locked into place, with country superstar Martina McBride announced as this year's National Anthem singer. Personally, I think she'll do a great job. Of course, the National Anthem is one of the most scrutinized aspects of the pre-race ceremony in INDYCAR, especially for the 500. Some people see it as excessive sensitivity or criticism, and yes, if Martina were to drop the ball on the National Anthem, there would be swift, angry social media commentary on the fact. Why? Maybe we're still all traumatized from Steven Tyler's word-changing rendition back in 2001. However, I like to think it goes a bit deeper. On a Sunday in May each year, the Indianapolis 500 is home to over 300,000 people, a goodly number of which at any time are deep into varying degrees of inebriation. Even those that aren't are populous enough in number to great a sort of sustained, massive murmur as the stands fill leading to the race. Yet, despite being a crowd of hundreds of thousands of individuals, there are moments where they come to respectful silence, almost as a single body. It's shocking to see so many people simply become quiet all at once, almost as if God himself pushed the "mute" button. The National Anthem is perhaps the largest example of this. It is no coincidence the Indianapolis is held on Memorial Day weekend. Over the years, items such as military flyovers, cheering our returning troops as they take a lap around the track, and songs such as "America The Beautiful" and the more recent "God Bless America" have become a key aspect of the race festivities. Simply put, you cannot separate--nor should anyone wish to!--the Indy 500 from a healthy dose of patriotism. We are given so much and complain about such small things; it seems proper, that at least for one day, the generations of men and women who gave the last full measure of devotion for our liberty can be afforded these small measures of respect and honor, even as we realize they aren't enough to pay our insurmountable debt of gratitude. So, if some of us seem sensitive when someone changes the words or forgets an entire verse to our National Anthem, please understand, it's not because we see ourselves as judges on "American Idol". It's because we genuinely care enough to see these measures of love and devotion carried out with the gravity and importance they deserve on a Memorial Day Weekend event. These things matter, and that is why we'll be wishing Martina McBride the best on Race Day, and thinking of our brothers, sisters, parents, and other loved ones in harm's way, as well as the blessings we have been given, while she belts out our National Anthem. Thanks again for your time, Bryan. It's been a long and winding road that's brought you to the Indianapolis 500. When did it first sink in that you were going to be a part of the Indy 500's Month of May? BC: I'm not sure that it has really sank in yet honestly. It has been such a grind to get to this point, that once we got the program put together, its just been nonstop work ever since. [Bryan Clauson] Community Day was really neat and a great way for me to kick off the month. I think at some point that day is when it all really sank in. Having all my friends and family along with some amazing fan support in one place to celebrate this opportunity kind of did it for me. I remember standing there looking around thinking man this is really going to happen. It is a crazy feeling! What are your thoughts on the DW12 as a racing machine? It seems quite a bit different than what you're used to driving. BC: The DW12 was great to drive in Texas. Having a limited amount of time in the car so far, maybe I'm still looking at it with rose colored glasses. The team at SFHR prepare amazing race cars, and I got the opportunity at Texas to experience that. It's hard to really guage how a car is going to race when you are testing by yourself. The ballgame changes completely when you are running around other car and not being able to take full advantage of the aero abilities of the car. I'm definitely looking forward to learning what the DW12 likes and dislikes as we progress throughout the month at Indy. What sort of driving skills transfer from sprints and midgets to INDYCAR, and what needs to be learned? BC: I think what USAC does to prepare drivers for the next level is it teaches you adaptability. To be a USAC Champion you have to be good in so many different cars in so many different environments, that if you can't adjust quickly, you will get left behind. The car control you learn is something that you will take along in any form of motorsports you progress to. The biggest thing to learn while transitioning into the Indy Car is the aero piece of the puzzle. Aerodynamics play such a huge role in making an Indy Car work and go fast. You have to constantly be thinking about what you are doing and how it affects the aero platform and balance of the car. It is just a different mindset and there is a bit of a learning curve there while making the switch. Clauson: USAC's envoy to this year's Indy 500. The Sarah Fisher Hartman Racing team has a reputation for being a very close-knit, family-style operation. What's been your experience so far in working with them? BC: The SFHR group is a very tight knit group. Their team chemistry is unbelievable. I knew the moment I walked into the shop for the first time that this was the place that I needed to be. I'm a firm believer in needing to surround yourself with great people in order to be successful. I don't think you will find a better group of people in the garage then what we have at SFHR. I think we as a team are going to make some noise this month! Going into the Month of May and your chance at the biggest race in the world, can you explain what you're feeling? BC: In short.... No. The range of emotion is slightly overwhelming. I've been fortunate to be able to have a lot of opportunities as a race car driver. This business is full of highs and lows. I'm proud to have been able to fight through everything that I've faced and be sitting here days away from starting the biggest month of my life. The 500 has been a lifelong dream, its a race I grew up dreaming about. The month of May is always special in Indy, but this month of May will be an extra special time for not only myself, but my friends, my family and short track racing. Do you think your presence at Indy this month can make any sort of statement about USAC, and if so, what sort of statement would that be? BC: Well I hope that we can go out and have a month that everyone in USAC can be proud of. USAC racing is something that I love and that I am very passionate about so to have the opportunity to represent that form of racing on the biggest stage in motorsports is a pretty cool feeling. Hopefully at the end of the month we can remind people that USAC guys can still get the job done at Indy, and maybe prop that door open for the future.